Glo Sharp Sharp eTop-Up now gives you 8 times the value of your recharge and it is exclusively available to new and existing prepaid customers who recharge their lines via any of the Glo etop up channels like Glo Café, Online, ATMs & POS, *805# Glo easy recharge solution, Bank mobile apps and short codes. 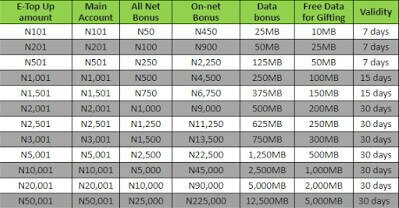 Recharge with airtime or data now to start enjoying this bonus. You also enjoy all plan benefits when you recharge with Glo eTop-Up. This offer is available in all amounts beginning from N101, N201, N501, N1001, N1501, N2001, N2501, N3001, N5001, N10001, N20001 and N50001 via ATMs, GloWorld outlets and dealer shops nationwide. You can only enjoy the Glo 8X benefit when you recharge with the exact amounts listed above and the 8X bonus can only be used for calls within Nigeria. International calls will be charged to your main account. Validity days cannot be accumulated. However your 8Xbonus validity days will be extended each time you recharge, depending on the top-up value. For example: N101 E-top up will increase your 8X bonus validity by 7 days while N1,001 E-top up will increase your 8X bonus validity by 15 days. The 8X offer is exclusively available on Glo E-top up. Recharges made through any other means including *123*PIN# or *323*PIN# will not get the offer. Also airtime received through EasyShare or Borrow me credit do not qualify for this offer. Calls from main account will be charged at normal plan rates. 1. When I use E Top-Up, will I still get the other recharge benefits accruable for my profile? Yes. When you recharge via E Top-Up, you get ALL the benefits you get when you use physical/paper recharge card. 3. You will browse from your main account at Flexi rate of N1/MB if you exhaust the value in the data bonus account, unless you have an active data subscription. 4. 8Xbonus offer can be enjoyed on any Glo prepaid plan so long as you recharge electronically with the eligible E-top up amounts.However, any unused bonus balances from previous top ups will be lost upon migration. 5. You can subscribe to other recharge based offers available on the Glo network. However only the 8X offer bonus will be credited to your account whenever you recharge with the eligible E-top up amounts.